Why would I need an Outdoor Kitchen in winter? Whether you just bought a brand new house or have been enhancing your long-term residence, you probably have considered acquiring one of those attractive Outdoor Kitchens. The advantages are endless and oh-so-appealing: the charm of the outdoors as cooking scenery, the idyllic sight of your family barbecuing together in the sunshine, having a beer fridge directly accessible when your friends decide to have a late night in your backyard. The magic of your moonlit outdoor kitchen is closer than you think. The easiest way to enjoy your outdoor kitchen come April is to start the project now. Your backyard is scarcely used this time of year, and it’s the perfect season to have a landscaping expert working on designing a great cooking space you will be able to use as soon as the sun starts warming up. In McKinney, Eric Scott has been working for 20 years to design outdoor solutions to match your wildest expectations. With Scott Design & Landscaping, having an outdoor kitchen seems even more appealing and stress-free than before. But Outdoor Kitchens are not built in a day, and getting started on your project during the winter is the best way to have a wonderful cooking space ready by the spring. You will soon be able to test out your new BBQ, pizza oven, beer kegs and admire your countertop in the early days of summer; you will be eager to plan your summer parties, and will love sharing your new outdoor kitchen in any weather, rain or shine. From your kid’s friends to your own, all ages will be catered to and every taste satisfied. With Scott Design & Landscaping’s expert advice and assistance, your project will come together with ease and will be adapted to your needs and desires. 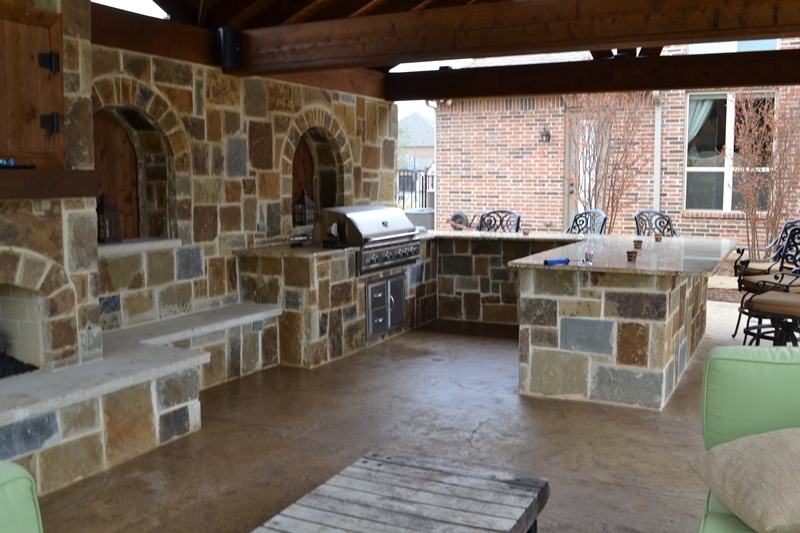 You can count on the landscaping experts in McKinney to take advantage of the wintertime to get a headstart on your outdoor kitchen design and creation, so you can rest easy and enjoy it all at the start of the warm season. Our landscapers will customize your outdoor space to be both functional and appealing, fit for all kinds of enchanting days, evenings, and weekends. Our experts will assist you in realizing your project, and your outdoors will be metamorphosed by the time the warmth comes back, to your great satisfaction. If you get in touch with us at Scott Design & Landscaping in McKinney now, we can get started on a plan and have your landscaping dream come true by summer. You will not be disappointed! Call us today at 972-562-9467 for a complimentary consultation and estimate. Contact us today! It’s Winter. Why Do I Need an Outdoor Living Contractor?